Christmas is only a week away and after the last few days of preparations I feel a little more ready for it. However, I will admit, panic was starting to set in just four or five days ago. The only thing I had done up to that point was put up tree and decorate a bit. If it hadn’t been for the help of my daughter and mother over the last week I would probably still be freaking out. Thank goodness we traditionally team up to decorate our homes and make holiday cookies (by the way, I helped them decorate their houses first-we have a system and mine is always last). In addition, the past couple of days I have either purchased or ordered the last of the gifts I needed. By the weekend the majority of them should be wrapped and under our tree. But maybe you are further behind than I am with your Christmas preparations. If you are running behind, here’s what to do when you have put off Christmas shopping. Not to put any additional pressure on you or anything, but what are you waiting for, Christmas? I hope not, because it will be here in just a few days even if you aren’t prepared. If you want to save Christmas when you have put off Christmas shopping, don’t put off ordering or shopping for your gifts any longer. You don’t have a lot of time left. Besides, the last thing you want to do is to stay up all night long on Christmas Eve wrapping or finishing up making gifts. Trust me, I know because I had to do it a few times several years ago when my kids were little. Fortunately, you still have time to get gifts for everyone on your list if you tackle the project within the next couple of days. Another solution when you have put off Christmas shopping is to make a simple project. Yes, if you can spare an hour or two per night or a few hours this Saturday you may still be able to get an easy project done. When you need to get a little inspiration, search the internet for quick projects you can handle in a short amount of time. If your budget is small, try making three or four things that are similar in assembly line fashion. Baking holiday goodies is another great gift idea when you have put off Christmas shopping. 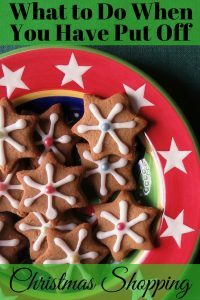 Whip up a batch of treats, put it on a pretty, inexpensive discount store plate and use it for a gift. Regifting a new item you have not used can help when you have put off Christmas shopping. Nevertheless, some people may not agree with this as a solution for gift giving. I say it is a frugal way to let someone else love a gift that may not have worked for you. Just because you weren’t able to use something doesn’t mean you didn’t appreciate the gift. It simply means it didn’t fit you or your lifestyle. Passing it on is smart and can save you money when gifting costs have gotten so out of hand these days. Giving the gift of your time can help you resolve the problem of not having gifts for the holidays. Make a couple of simple coupons on the computer to babysit, wash their car, or do some other chore. Try to think of service ideas they would really appreciate or need. As a last resort you could always pick up a few gift cards. If you decide to go this route, though, choose to get the cards from stores you know the receiver frequents. It isn’t always easy to get everything done for the holidays when there is so much extra to do. If you have put off Christmas shopping up until now you still have time to salvage Christmas. Use these tips to get your shopping done and still make the season merry and bright. Have you ever put off Christmas shopping before? If so, what did you do to get everything done?